“Every 10 minutes to everywhere” envisages high quality public transport across Melbourne. All trams, trains, and main road buses would be upgraded to run at least every 10 minutes, from 6am to midnight, 7-days-a-week. 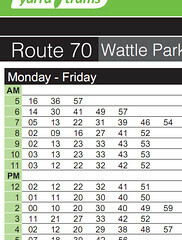 Nightrider buses would run half-hourly, 7-days-a-week. Routes would be extended in some cases, with new rail lines to serve outer suburbs. Trams and buses would be given traffic light priority, to speed up services. Accessible vehicles and stops would be rolled out faster to ensure faster loading, access for wheelchair users and parents with prams. The result is that all of Melbourne would be served by fast, frequent, direct public transport routes. Only a small proportion of people in greater Melbourne come into the CBD and inner-suburbs on a regular basis. Public transport mode share for this inner-area is already high (and, together with other non-car modes such as walking and cycling) can’t get much higher. But mode share for trips in the rest of Melbourne is well below 10%, with the vast majority of trips being by car. To make a real impact on mode share (and thus traffic congestion, petrol prices, and transport emissions), public transport needs to be upgraded to provide every suburb across Melbourne with a time-competitive alternative to driving, for most of their trips. Public transport that provides genuine “walk up and go” convenience across the city does not need vast amounts of money to be spent on infrastructure – but it does require a big boost in service quality so that people will gladly leave the car at home. Provide all of Melbourne with a viable alternative to driving, for trips currently not competitive by public transport. Resultant increase in mode share (up to the 20% target, and beyond), and a reduction in fuel usage and greenhouse gas emissions.